Margaret Claret de la Touche was born on the 15th of March, 1868, at Saint Germain-en-Laye, where Mr. Claret de la Touche was Customs' Officer, she was welcomed with copious tears. Her parents wanted a son, especially her mother, who had prayed so fervently to the Blessed Virgin and lit so many candles at her altar that she believed she would certainly obtain her petition. Her disappointment was so great that it was feared that she would die. Her husband consoled her and her friends made the happiest predictions for the newly born child. Health, beauty, happiness were to be for her whole life the lot of Margaret. Although her family practised their faith it was perhaps more out of duty than devotion. When Margaret was about ten and a half her mother bought her a Catechism and told her to study it in preparation for the Catechism classes in November but she had previously learned very little Christian doctrine but even still she distinguished herself in the class of 80 pupils. It was around this time that Jesus first made His presence felt; one day her sister had read a passage from a study book and told her as an exercise to rewrite it in her own words. Margaret who was struggling to begin the exercise decided to have a quick glance at the book for some inspiration on how to begin but as she made her way to the forbidden book an invisible barrier about chest high like an arm stopped her and the sweet but grave voice of a man said ‘What you are going to do is wrong’ and she rerplied ‘Oh, I will only look at one line, just the first line.’ and immediately the barrier was removed and she felt free to continue but she paused and thought to herself: ‘All the same, I have been told that it would be wrong. . . .!’ and then she promptly turned and returned to do her homework and completely forgot this incident until 15 years later when she realised that she had heard the voice of Jesus before and then recalled this incident. She made her first Confession on the 29th of March 1879 and her first Communion and her Confirmation on the following day. During the ceremony after swearing fidelity on the Holy Gospels she fell into the arms of a Priest and later she felt that this was an early sign of that Jesus had given her to his priests. Three weeks later at the age of 11 she was given the grace of making a vow of virginity. At that age she did not fully understand this vow but she believed she was promising never to marry. It made her very happy to renew it and also made her have a new aversion to any family caresses and she became more reserved and distant to people. She renewed her vow quite frequently. A mistress was hired to teach her for some time everyday and her grandmother, older sister and her step-father taught her school studies and her mother was in charge of her moral upbringing but to a great extent she forbid Margaret from reading religious literature. Her mother gradually formed Margaret for the world wishing to make her strong, courageous, elevated above all weakness and effeminacy, which she deemed unworthy of beings endowed with reason. This was not from any Christian perspective. She would quote Socrates and the Sages of Greece but never mention Christian heros and Saints. She limited her choice of religious books and forbade her to read the life of St. Teresa of Avila. The family were wealthy having a Winter home in Valence and a Summer home in the country and often spending Spring and Autumn in Paris or travelling abroad. Her home was a social meeting point for family friends who would take turns to put on some musical entertainment or hold a dancing party or some little commedy. Margaret though living in the world kept herself from the world to a large degree because deep down she had not given up her idea of religious life. From around the age of 15 she experienced a hunger in her heart that nothing seemed to satisfy until later when she entered the convent. During the summer when they stayed in the Castle of Arbods the family would read, take long walks, have discussions but always attended Sunday mass. Over the next few years Margaret struggled to pray and hold on to her hopes of a vocation. Meeting the author of a scandalous novel gave her a new conversion and in 1886 a severe illness required the help of a nursing Sister who encouraged Margaret to persevere in her desire for religious life and taught her how to pray better. Margaret knew that she had a vocation but realised that her mother would not consent and that she would have to wait until she reached her 21st birthday. The thought of continuing on in the worldly life she was living was daunting. She asked her mother to let her attend college to get a diploma in the hope of escaping from the life she was living but her mother refused. Disheartened she returned again to the same old lifestyle but did not give up her hopes. Around this time a young army officer became a friend of the family and Margaret fell completely in love with this reserved a christian young man. One night about the 8th of June she was wallowing in romantic thoughts about him when the cold dark spectre of her vow of virginity suddenly sprang to mind! She had completely forgotten it and now it loomed over her as a terrifying icy spectre! All night a terrible battle took place in her heart and mind: Jesus or the young officer? She hid under the blankets to hide the sobs and tears and in the morning the battle was over. She recalled later on that she felt like the mob who replied to Pilate: “Give us Barabbas!” and as for Jesus: “Away with Him!” She had fully decided and planned to ask the Bishop to obtain for her a dispensation from her childhood vow and she had planned to give 500 francs to St Peter's Pence and 500 to the bishop for his works of charity. On Sunday the 12th of June the bad news was casually broken to her of new circumstances which meant that a romantic union would be impossible. Poor Margaret was literally devastated! Even though she put a brave face on it and did not let on but underneath she was bitterly crushed. Margaret received a great healing and graces in September while reading “The Life of Saint Aloysius of Gonzaga”. She saw clearly that God had chosen her from youth and marked her with the sign of virginity and she decided fully to become a religious. She then renewed her vow of chastity and asked God to pardon her infidelity. On the Feast of Our Lady of Mercy 24th of September she went to confession and felt a strong urge to open her heart to the priest, he told her to get a Spiritual Director and recommended Fr Raymond the Curate of Valence. All she had to do now was wait a few months until her 21st birthday on the 15th of March 1889. She decided though to wait until after the 7th of April which was the date of the 1st Holy Communion ceremony that year so that she could try and obtain all the graces she would need to ask her mother's consent again and if necessary use her right to enter the convent as she was now of age. On Palm Sunday she was alone with her mother and her stepfather, at first she could not bring herself to ask her mother so she told her stepfather who laughed at the idea and then she called her mother who gave her consent amidst tears and sobbing declaring that she could not go against the will of God but also asking the condition that she defer entry for two years. Margaret initially agreed to defer and contacted Fr Raymond and he said he would think and decide what order she should enter. Her mother did not let go easily and indeed she fought against her plans with all kinds of assaults and entreaties right up to the day she entered. On the journey home a young lawyer accompanied the small group and her mother heard about it and again all kinds of entreaties were made to her to marry this young man but she defended her vocation ardently. But when she went to her room all the old ideas against her vocation assailed her and she wondered truly if it was providence Who had put this young man on her path. She was giving in to these temptations but the realisation of all that God had done to try and win her for Himself crossed her mind and in deep anguish of heart she knelt down on the floor with her arms outstretched like a Cross and suddenly got the inspiration to renew her vow and afterwards she was not tempted again about leaving the world. Nine Days before her entry she visited the house and God gave her a preview of her future as she recalled later herself; “The sacrifice involved in religious life which I desired, by my faith, which I wished because I knew God wished it from me, was shown to me in all its rigour, and God allowed me to taste its bitterness.” In the evening of November the 20th she stepped in and the doors were closed behind her. Later when she went to her room she knelt down in front of a Crucifix and her heart wept for quite a while at the separation from everything that she loved on earth. Her motto would now be “Let nothing of me remain, but a humble servant of Jesus Christ always ready to obey His divine will.” The Vicar General of the Diocese laughed when he heard of her entry into the convent a pious lady from Valence laughed too when she heard the news and said to the Rev. Mother; “If you want a subject who is a good actor in comedies Miss de la Touche is just the person for you; she is an excellent comedienne.”! Margaret was made to wait two months before being allowed into the Noviciate during which she felt like a stranger in the house. On January the 17th 1891 she was allowed to enter and took the name Sr Louise Margaret. God allowed her to experience her human weakness in the sense that she became awkward or clumsy in everything. She could not do her work well or read well. Of this she wrote herself; “It was one of the greatest causes of suffering during my first years of religious life to see myself unable to take a hand at the common occupations like the other Sisters; incapable of stretching out the linen that had been washed, of doing the sweeping and other such little tasks as are usually performed by novices and young professed Sisters.” When she offered to do some job she would hear “Oh! not you, Sister!” This: “Not you, Sister” pierced her heart. When the Mistress of novices asked her to sing louder in the choir the result was so unhappy that she was relegated to the ranks of the Associate Sisters. She loved to sing the praises of God. She had developed her own simple way of meditating but her Novice Mistress forbid her to use it and to follow the way she taught her which she felt constrained her soul but later realised that it had been a very good discipline for her mind. She was assailed with the most humiliating temptations against the Faith and these temptations and blasphemies seemed to come from someone beside her rather than from within her and she had no control over them. Her confessor remained silent and her Novice Mistress did not understand. This did not stop her sufferings and in fact they increased but in her heart she received a peace which the world cannot give. On each of the following 8 days or of the Octave of the Sacred Heart Jesus spoke to her of the dignity of priesthood, of His love for them, of the return of love which He expected from them and of the new bond of union which He wished to form between them. He ordered her to write down the instructions which He gave her during this Octave. On June 7th He said to her: “The heart of my priest ought to be a burning flame, warming and purifying souls. If the priest only knew the treasures of love which My Heart contains for him! Let him come to My Heart, let him draw from It, let him fill himself with love until it overflows from his heart and spreads itself over the world. There were 4 main parts to the mission that Our Lord revealed to Sr Louise Margaret during her religious life for His Priesthood and the whole Church. The Friends of Bethany of the Sacred Heart are men, women, young people, and men and women religious of other institutes who live the donation to God Infinite Love and cooperate with prayer and support, so that priests can live fully their ministry as Sowers of Love. Sr Louise Margaret received tremendous insights and understanding on the Mystery of the Trinity and the nature of God Himself. She was given great understanding of God as Infinite Love, in fact “Infinite Love” is the term or name that she used for God. She was told by Fr Charrier to write down every light she received and later on she was told by Bishop Filipello to write a little book in which she would bring together all the lights which she received on the sublime subject of the Infinite Love of God. Due to her failing health and approaching death she was unable to complete writing this book but she left a plan of the book and instructions from where in her notes the chapters were to be taken from. This book is also especially recommended to members of the Priest’s Union. An anti-Catholic law was passed in France in early 1904 against Religious Congregations, all property of teaching Orders was liable to confiscation and the members were to be disbanded. They had the choice of returning to the world or trying to find refuge in another country if they could find a bishop to accept them. The Visitation Order is not a teaching Order in general but Sr Louise Margaret's house in Romans had set up a boarding school after the French Revolution because that was the only way the Law would allow them to reopen and so in February 1904 her Monastery was on the official list for liquidation. They closed the boarding school in the hope that it would prevent their liquidation but in vain. Sr Louise Margaret realised that it was God's will in the sense that St Francis de Sales set up the order as one of contemplation and hiddeness from the world. The Superior: Mother Marie Emmanuel, another Sister and Sr Louise Margaret went on a trip of exploration through Italy on the 19th of August 1904 in the hope of finding exile for the community of approximately 50 Sisters. The Mother Superior returned again in October and was able to rent a Castle of Count Berice near Turin in case of their eviction from Romans. They were violently expelled on the the 6th of March 1906 after the last appeal of the unjust eviction order failed. The soldiers came and battered down the doors of the Monastery and after some violent scuffles with supporters of the Sisters the Mother Superior calmly read out their protestation. They were all escorted out of the Monastery and received honoured accomodation in a friend's house. On the following day they were escorted by friends to the train for their sad departure to Italy. But Sr Louise Margaret saw the hand of Infinite Love in this crisis and indeed in every crisis. For it was in Italy that Providence had planned to start the Works of Infinite Love. Shortly after their arrival in Italy Mother Marie Emmanuel became very ill and Sister Louise who had been her secretary became burdened with the responsibility of the community more and more. Mother Marie Emmanuel's second term of office finished on the 11th of May 1907 and Sister Louise was elected as the new Reverend Mother on the 16th of May. This was a very big shock and burden for her. But she accepted God's will and made plans to try and bring the community back to the way of life intended by their founders St Frances de Sales and St Jane Frances de Chantal. With the advice given to her by Fr Charrier who quoted the General of some great Order who once said “I have Superiors in abundance, but I find very few Fathers among them” she was also determined to be more a loving Mother to the community than their superior. It was her responsibility to give a conference or talk to the Sisters at their chapter meetings and she used the oppurtunities to teach the doctrine of Infinite Love. At her first one given two days after her election she said“For myself, my beloved Sisters, my sole ambition will be to aid the Master in doing His Work of love in this dear family.”. As their was three years to the 3rd centenary of the foundation of the Visitation Order the 6th of June 1910 she asked the community to see them as a tridium of preparation during which they wopuld return to the spiritual roots of the Order and increase the love of God among them by increasing the love of neighbour and so to increase their unity like that which Jesus prayed for His Apostels: “That they may be one as We are one”. One of the biggest problems Mother Louise inherited in her new office was the need to find new accommodation for the large community of 50 sisters. The anti-Catholic press were demanding a law like the one in France to expel Religious congregations and the contaminated water supply in the house was the cause of serious illness among many of the community. When all hope seemed to be gone the Countess of San Marzano in Mazze in the diocese of Ivrea rented them her large house “La Torretta”. In December 1903 she wrote the prayer; “O Jesus Eternal Priest” and in 1905 Fr Charrier had it presented to Pope Pius X to have it indulgenced and later on the Pope wrote his encyclical on the Priesthood and her prayer contains ideas identical to his encyclical which shows that the prayer expressed ideas that were very dear to his heart. Perhaps the most pressing problem of all for her spiritually was the ongoing delay of Fr Charrier pronouncing a judgement on the divine orign of her writings and his reluctance to write a book for the benefit of the Clergy based on her notes. She wrote to him often and tried to persuade him to make a decision and to start writing the “The Sacred Heart and the Priesthood”. In 1907 she wrote to him complaining that he had her notes for 11 years and was still unable to make a decision about them. Part of the problem for him was the idea that Our Lord wanted him to write the book and set up the Priest’s Union. In 1908 his Holiness, Pope Pius X, composed and published his Encyclical to the priests of the world which contains so many ideas in common with The Sacred Heart and the Priesthood that it may be said to be a summary of it. Our Lord had already told her that it was this Pope who was to sanction the Priest’s Union. Fr Charrier decided to ask Fr Hamon S.J. a well known expert to examine her writings and he was very impressed by them and he felt that a book should be composed from them. In January 1908 Our Lord expressed His desire that the book should be written as a first step in setting up the Priest’s Union. On the 23rd of January 1908 Fr Charrier agreed to start the book but deep down he was still somewhat reluctant. In April of 1909 he still had not composed the book and Mother Louise sent him a slightly reproaching letter and this caused him to make the decision that he could not write the book and he would send her writings back to her. She met Fr Poletti on the Feast of the Sacred Heart and he agreed to examine her papers and afterwards he felt that nobody else should write the book but she herself. “The subject matter of the book is worthy of the deepest interest. It contains an exposition of the sublime relations of intimacy and love between the Heart of Jesus and the heart of the priest, and of the touching harmonies between the Heart of Jesus and the Priesthood; it recounts all that the Divine Master has done for those whom He calls ‘His friends’; it lays before the priest the necessity of forming his heart and inspiring his life by this ineffable model of the Heart of Jesus. Jesus demanded that Mother Louise and Fr Charrier should completely donate themselves to Infinite Love so that they could become His instruments of spreading the message and promoting the work of Infinite Love. He promised special favours to those who make this Act of Donation and it is the official Act by which Priests are admitted into the Priest’s Union. Fr Charrier deferred making this Act of Donation for about 8 years much to the distress of Mother Louise. “O Infinite Love, Eternal God, Principle of life, Source of being, I adore Thee In Thy sovereign Unity and in the Trinity of Thy Persons. I adore Thee in the Father, omnipotent Creator Who has made all things. I adore Thee in the Son, eternal Wisdom by Whom all things have been made, the Word of the Father, incarnate in time in the womb of the Virgin Mary, Jesus Christ, Redeemer and King. I adore Thee In the Holy Ghost, substantial Love of the Father and the Son, in Whom are light, strength and fruitfulness. I adore Thee, Infinite Love, hidden in all the mysteries of our Faith, shedding Thy beneficent rays in the Blessed Eucharist, overflowing on Calvary and giving life to the Church by the channels of the Sacraments, I adore Thee throbbing in the Heart of Jesus, Thine ineffable Tabernacle, and I consecrate myself to Thee. I give myself to Thee without fear with the fullness of my will; take possession of my being, penetrate it entirely. I am but a nothing, powerless to serve Thee, it is true, but it is Thou, Infinite Love, Who hast given to this nothing and Who dost draw it to Thee. Behold me then, O Jesus, come to do Thy work of love to labour to the utmost of my capacity in bringing to Thy priests, and through them to the entire world, the knowledge of Thy mercies and of the sublime and tender love of Thy Heart. I wish to accomplish Thy will, whatever it may cost me; even to the shedding of my blood, if my blood be not unworthy to flow for Thy glory. O Mary, Immaculate Virgin whom Infinite Love has rendered fruitful, It Is by thy virginal hands that I give and consecrate myself. Fr Charrier delayed for two years in making this Act of Donation to Infinite Love which he made on 5th of January 1912. Mother Louise Margaret had tried to persuade him with letters during that time. He felt unworthy and was afraid of being unfaithful to it. She gave the example of how St Peter promptly and simply replied “Yes Lord You know I love You” when asked by Our Lord “Do you love Me?”. Mother Louise Margaret understood that the Act of Donation would be the bond of unity in the Priest’s Union. He was born at Castlenuove and was ordained a Priest in 1881. As a youth he had the privilege of knowing Saint Don Bosco and receiving his last blessing. He worked for 17 years in the parish of St. Francis de Sales in Turin and was ordained bishop of Ivrea in 1898. He was loved by the priests in his diocese and was regarded as wise and holy. In November 1908 when Mother Louise Margaret wanted to transfer her Community to Mazze in his diocese she wrote to him for permission and he warmly welcomed them and visited them in the following January. In April he made his canonical visitation and he asked Mother Louise Margaret to ask the Community to pray much for priests, and told her that he had an ardent desire to do something for them in honour of the Sacred Heart. Mother Louise Margaret was profoundly moved by his devotion for priests she sensed the hand of God in this encounter. She assured him of the prayers of the Community and told him that one of the Sisters was very specially interested in this subject. When he asked her for more precise information, she gave him some of her Intimate Notes dealing with the love of the Heart of Jesus for His priests. He took them home, examined them at leisure, meditated on them, and soon declared that he was very happy with them. On his next visit he asked her to let him meet the Sister who had written these notes, and she, blushing with confusion, could only reply: “My Lord, she is here before you.” He recognised that there was something great and mysterious in all this, but he prudently refrained from speaking to her about the subject for a whole year. Our Lord revealed to Mother Louise that the Priest destined to direct the Work would be the first Priest who would consecrate himself to Infinite Love using the above Act of Donation. Bishop Filipello had read and made the Act of Donation after he found it in her notes and wrote to her to thank her for it and to tell that he liked it. She wrote back to him telling him that she believed that he was the Priest marked out by Our Lord to found the Work. Monsignor Filipello asked her to write down in a few pages all the necessary information for starting up this Priest’s Union. She wrote in this letter that it seemed to her that; “Jesus wishes an organisation that will unite priests, - the good and faithful ones, those who are truly attached to sound doctrine, - and group them around their bishop in each diocese and that all the dioceses be linked together and grouped around the Pope, the headquarters of the organisation being wherever the Pope resided. The priests of this organisation (which would not be merely a work of prayer like that of Father Eymard but an active work) would labour in the spirit of the little book to diffuse the knowledge of Infinite Love around them and preach love for Jesus Christ, God and man, and fidelity to the Church and the Pope.” He asked her to draw up a plan for the Statutes of the Priest’s Union and he would bring them to Rome and consult the Pope. The first draft was ready in December 1910 and in May 1911 they were presented to Cardinal Gennari in Rome. Pope Pius X asked Monsignor to wait before starting the Priest’s Union in his diocese because it coincided with the launching o0f another work by Cardinal Dubillard and the Pope felt that they would both fail if they started at the same time. Our Lord revealed to Mother Louise on the 15th of November 1911 and again in 1913 that He wanted the statutes revised because they did not reveal Love sufficiently well. “Contrary to what you fear, I come to the conclusion that your trouble is a trial from God, Who permits the adversary of good to come and disturb you. O.....................“Remain calm and tranquil; continue to abandon yourself to the will of your divine Spouse Whom you have chosen. Note down always, under obedience, according as you have time, the interior impulses, lights, and words which you receive. “When I come, arrange things so as always to have a little free time for your soul, then unburden yourself freely of your troubles, without worrying either about taking up my time, or about the manner in which you are to express your sentiments. As for me, I am ready to aid you as a Father; I am even prepared to come this very week.? Mother Louise was truly delighted to finish her second term of office but as she made such a strong impression on the community it was impossible for her to be able to takes the lowest place as she dearly wished. She heartbreakingly realised along with the advice of the community confessor that the best thing for the community was for her to leave it. Bishop Filipello was at first against the idea but with the suggestion of her being sent to the House in Rome he realised that he could get advice and support to help set up the Priest’s Union. She would be able to get her notes judged by competent authorities in Rome. It was a very painful change for her to have to leave the Community in which she made her profession many years before. She also had to make her journey to Rome in slow installments as it was felt that the Summer heat in Rome would be too dramatic a change for her delicate health so she went from one Visitation house to another asking hospitality along the way to Rome. She herself felt like she was a burden on each Community she visited and stayed with but the Sisters regarded her as someone of great virtue and talents. She left the House at Parella on the 6th of August 1913 and went first to the House in Turin and for a short stay at the House in Genoa and then on to Pisa. From Pisa she went on to Massa. From ther she expected to be sent on further to Rome but instead she received an “Obedience” to go to the House in Bologna and wait for further instructions. The Reverend Mother of that House feeling uneasy had asked His Emminence Cardinal Della Chiesa the Archbishop of Bologna and the future Pope Benedict XV for advice and in doing so he was made aware of her work and also received a copy of the The Sacred Heart and the Priesthood. Later when he became Pope he protected Bethany of the Sacred Heart and after her death ensured that The Book of Infinite Love was completed according to her wishes. On October the 29th Bishop Filipello wrote to her to ask her to set out for Rome. Bishop Filipello told her to talk to different Cardinals and Bishops about the Priest’s Union presented under the aspect of a universal bond of charity which would unite priests and associations without absorbing them. While there Cardinal Gennari and Cagiano de Azevedo told her that it was the will of God for her to found the new monastery Bethany of the Sacred Heart. The Priest’s Union was approved and arrangements were made for the founding of Bethany of the Sacred Heart a monastery of Sisters who would pray and immolate themselves for this work. She had the consolation of her first audience with Pope Pius X. She also gave in all her notes and writings to be examined by competent authorities and was interviewed and questioned about them and also about the new monastery and the Priest’s Union by the Holy See. In January 1914 she presented her petition to found the new monastery. On the 30th of January 1914 the immediate foundation of the new monastery in the diocese of Ivrea and under the authority of Bishop Filipello was sanctioned by the Sacred Congregation. By sanctioning the foundation of the new monastery they were sanctioning the Priest’s Union too because the new monastery was to be the helpmate of the Priest’s Union and also both were treated as one work by the Sacred Congregation. As there was some problems about finalising the name of the new monastery and also getting the new draft of the statutes approved the final official approbration by the Sacred Congregation did not occur until January 25th 1918 which was nearly three years after Mother Louise Margaret's death. It was also thought better to wait until the war was over before trying to start it. But at that stage the new monastery was to be called “Bethany of the Sacred Heart”. In the meantime before Mother Louise left Rome she and Sister Margaret had another audience on February the 5th with Pope Pius X who had just sanctioned her work and would die just a few months later on August the 20th 1914. At this audience he placed his hand on her head, pressed it firmly and for quite a long time and blessed them again. Mother Louise along with Sister Margaret returned to Turin on February the 18th 1914 and stayed with the Sisters of Charity. Their first priority with the aid and direction of Bishop Filipello was to find a suitable house for the New Monastery. One Saturday in early March Madam Bolocco who owned some properties went to visit Bishop Filipello to tell him that she had a house to rent and that she wanted to rent it to Religious and by providence Sister Margaret was present with another Sister in the Bishop's house when they called so it was quite clear to him that this would be the house for the New Foundation. The house was the one Mother Louise had seen in a vision in October 1899 and it was opened on March the 25th 1914 with the small community of three sisters. They were obliged to live in great poverty as the first world war started in August 1914. They lived day by day with just barely enough to live on and so they relied totally on providence to care for them and all their needs. Two postulants had entered in March 1914 and in early 1915 Mother Louise wrote to Bishop Filipello to tell him that the Community had grown to five and also that there were two young ladies who were hoping to join them. Due to a lack of understanding of the Mission given to Mother Louise and this new foundation there were appeals to Rome to have it closed down. This hurt Mother Louise but she accepted every trial and obstacle with great trust in God. She knew that people would probably only realise and see the true motives of her actions after she was dead. In July 1914 Mother Louise wrote to Fr Charrier to tell him about the attack of the very painful illness known as Bright's disease and which prove to be fatal. She endured this illness from July 1914 until her death in May 1915. For several months before she died she was unable to either stand up or to lie down and spent all her time confined to an armchair. Only her confidante and successor Sister Margaret had knowledge of some of the agony she was going through every day and night and also understood something of her heroic virtue in continuing her daily duties of Reverend Mother, Novice Mistress and Spiritual guide to the community right up to three hours before she died. From her appearance during the nights Sister Margaret recognised that there was a supernatural aspect to her illness and that dshe had the appearance of one crucified. After a life full of suffering she passed away peacefully after pronouncing the Sacred Name of Jesus at three o'clock in the afternoon on Friday the 14th of May which was the day after Ascension Thursday in 1915. She too had finished training and forming her successor and community and as she had prophesied before that Jesus would take her home if she was no longer needed for the work of Infinite Love in this life. 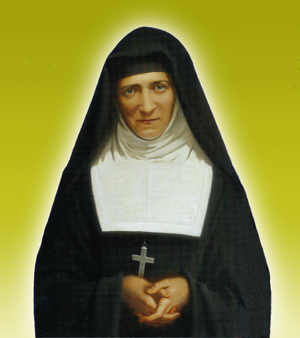 Her heroic life and sanctity have been examined by the Church and she is now declared “Venerable Louise Margaret Claret de la Touche”. One miracle is necessary for her beatification and then one more for her canonisation as a Saint.